Preheat oven to 350°. Line 2 (12-cup) muffin pans with paper liners. 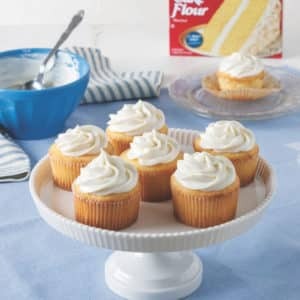 For cupcakes: In a large microwave-safe bowl, microwave ½ cup butter until melted, about 30 seconds. Add graham cracker crumbs and ¼ cup sugar, stirring to combine. Press graham cracker mixture firmly into bottom of prepared muffin cups. 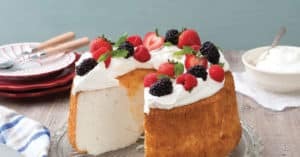 In a large bowl, beat remaining ½ cup butter and remaining 1 cup sugar with a mixer at medium speed until fluffy, 3 to 4 minutes, stopping to scrape sides of bowl. Add eggs, one at a time, beating well after each addition. Beat in vanilla. In a medium bowl, whisk together Swans Down® Cake Flour, cocoa, baking soda, and salt. Gradually add flour mixture to butter mixture alternately with buttermilk, beginning and ending with flour mixture, beating just until combined after each addition. Spoon batter into prepared muffin cups. Place a chocolate nugget in batter in each muffin cup. Bake for 15 minutes. Let cool in pans for 10 minutes. Remove from pans, and let cool completely on wire racks. For icing: In the top of a double boiler, whisk together egg whites, sugar, vanilla, and cream of tartar. Cook over high heat, whisking constantly, until sugar has melted and mixture is hot, 5 to 7 minutes. Pour into a large heatproof bowl, and beat with a mixer at high speed until soft peaks form. Spoon into a piping bag fitted with a large star tip. Pipe icing onto cupcakes. Using a kitchen torch, lightly brown marshmallow icing.